Described by its director as a 'mental atom bomb' and form of family therapy (it features three of his sons), The Dance of Reality is counter-culture icon Alejandro Jodorowsky's seventh feature in a career spanning nearly 60 years. Best known for his genre subversions – western El Topo, slasher Santa Sangre – this time he plumps for an imagination-fused autobiopic. He presents a warped version of reality, fashioned from memory, elevated by fantasy, and unfolding like a dream. 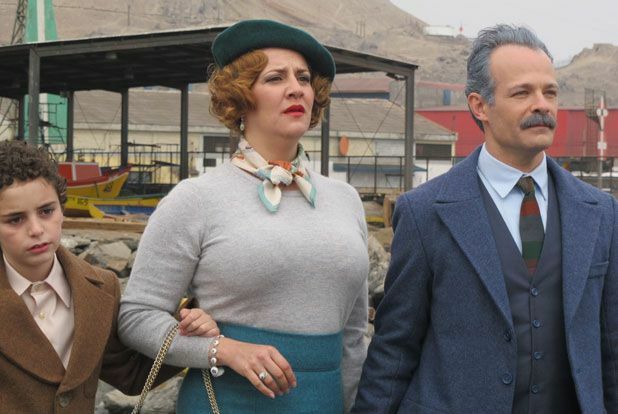 This passionately personal project combines telenovela-style melodrama, operatic outbursts, political upheaval, and lashings of surreal humour. It begins in Tocopilla, Chile, home of the young Alejandro (Jeremias Herskovits), who suffers various cruelties and indignities at the hands of his brutal communist father Jaime (Brontis Jodorowsky): his mane of girly hair is shorn; he's forced to endure dentistry without anaesthetic; and becomes the mascot to the local fire brigade, after the death of their dog, where he's pressed into confronting a charred corpse. Touchingly, the director appears in person to impart his wisdom and to offer, much needed, comfort to his younger self. The Dance of Reality has taken its time to get to us (it premiered at Cannes 2013) but it's worth the wait. Jodorowsky was offered complete creative freedom by French producer Michel Seydoux, and Seydoux's trust has been rewarded with a film that's as sincere as it is idiosyncratic. If it begins with broad strokes, with Alejandro's father a militant, moustachioed bad guy, then it is Jaime's journey that is the most eventful and transformative, with his mask of villainy pulled back to reveal a man of political principle, who's tormented by his inability to summon the courage to act on his impulses. There's more than a touch of Fellini this time round but this is unmistakably a Jodorowsky film – with the eccentricity we've come to expect from the director revealed as the stuff of his childhood – and, although simply shot, content-wise it's still entirely in keeping with the exuberance and traditions of his oeuvre, particularly in its compassion for those on the sidelines of society. The Dance of Reality is a surprisingly moving, emotionally satisfying experience, which twirls you round in a warm, confident embrace, making sure to toss in plenty of its director's signature madcap moves. Young Alejandro (Herskovits), growing up in Chile, suffers at the hands of his brutal communist father Jaime (Jodorowsky). Dreamlike and surprisingly moving autobiopic by the veteran director (El Topo, Santa Sangre), with compassion for those on the sidelines of society.